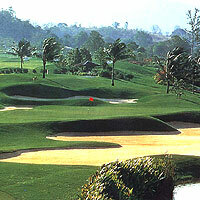 Widely considered as the best course in Pattaya, this 27-hole layout is as fun as it is challenging. The course has three distinct nines, the Lakes, Mountain and Valley Courses, each offering their own unique challenge. The Lakes and Valley courses meander along pristine natural waterways while the Mountain nine provides commanding views of the surrounding area and is a stern test of golf. If at all possible, play all 27 holes, especially since carts are mandatory. The clubhouse has commanding views overlooking the Lakes and Valley Course and the staff are used to catering to tourists. Jack Nicklaus would be proud of the fact the owners have kept this course in good shape and continue to make small improvements on a consistent basis. This is Pattaya's best track and one of Thailand's top five designs. Try to include the Mountain course and if possible it's worth playing all 27 holes.